ADJ’s myDMX lighting control software is used to operate the rigs in all kinds of entertainment venues across the globe and is also a popular choice for mobile entertainers looking to make the most of their portable light show. 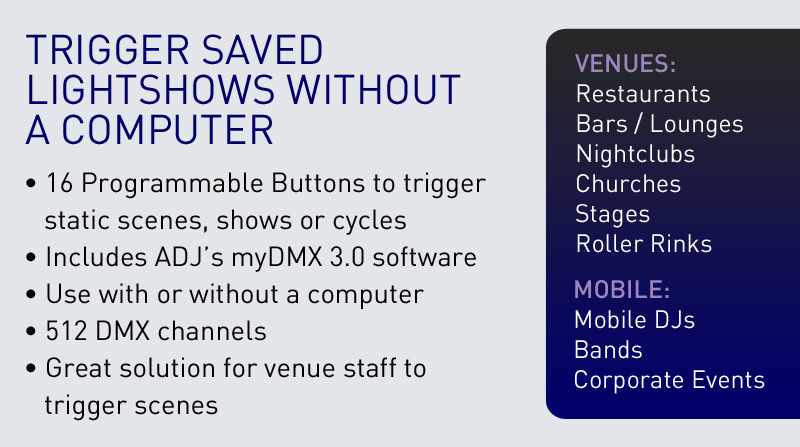 The key to the success of myDMX is its simplicity; it makes powerful DMX control easy as well as affordable. Now, with the introduction of our new MyDMX-RM interface, ADJ is expanding the boundaries of what can be achieved with the myDMX eco system by opening up a variety of new possibilities for both fixed installations and mobile lighting systems. The MyDMX-RM is a robust new 19-inch rack mount hardware dongle for the myDMX 3.0 software that acts as the bridge between your Windows or Mac OSX computer and your DMX-controllable lighting fixtures. On its back panel it is fitted with a USB input socket, for connection to your computer, as well as both 3-pin and 5-pin XLR output sockets, meaning that it can easily be connected to any DMX-compatible lighting fixture. However, what really makes the MyDMX-RM stand out is its 16 assignable trigger buttons that are arranged across its front panel. Lighting programs created within the myDMX 3.0 software can be easily saved and assigned to these buttons. They are stored on the device itself and can be instantly recalled, simply by pushing the button, even if the computer running myDMX 3.0 is disconnected. Each of the trigger buttons is also backlit, to provide a simple visual indication of which stored program is currently running. This means that the MyDMX-RM can be used as a standalone lighting controller as well as a software interface. The unit allows control of a full DMX universe (512 control channels) in both its Live and Standalone modes, while multiple interfaces can be ‘stacked’ to allow control of two or three universes of DMX channels from a single myDMX 3.0 program. Out of the box, the MyDMX-RM allows you to use myDMX 3.0 Express Mode, which includes all of the standard features needed to setup, program and control a lightshow. It is then possible to upgrade the software (via store.dmxsoft.com) to unlock advanced features such as a 3D Visualizer, MIDI control and ‘Easy Remote’ smartphone/tablet control app. Featuring a large library of fixture profiles – as well as a custom Profile Editor – it is easy to setup myDMX to control any DMX-compatible lighting or effects equipment. An intuitive interface and powerful features (including a drag-and-drop effects generator) then make programming and controlling complex shows a breeze, while the latest version of the software – 3.0 – also includes additional useful features such as Blind Editing (the ability to change scenes without outputting DMX) and the option to playback multiple scenes at a time. Since the MyDMX-RM allows standalone operation, it is ideal for use in venues such as lounge nightclubs where a lighting operator may not be present at all times. If you are an LD in such a venue you could store ‘warm-up’ lighting looks on the myDMX RM’s internal memory to be activated by a Duty Manager when the venue opens. Later, when it’s time to transition from a bar atmosphere to full-on dancing, you would then be able to hook up your laptop to the interface and seamlessly assume full control of the rig. The unit is also ideal for small bars and clubs that can’t justify the expense of a designated lighting operator. If you are an equipment installer working in such venues, you can now go in to a venue, setup an impressive lightshow for your clients, program it using your laptop and then leave just the MyDMX-RM to provide the flexibility of selecting different programs without the need for a dedicated computer or for staff to learn how to use the myDMX software. The different looks and effects which you create could then be easily triggered by a member of the venue’s staff, or the DJ to complement their musical mix, without the need for anything more than the most basic of training. Finally, if you are a mobile entertainer or a lighting designer, the MyDMX-RM can also be used to provide a level of backup against a computer crash. When controlling a rig from myDMX through the MyDMX-RM you can store important scenes on the unit’s internal memory so that if the computer running the software crashes, or stops functioning for any reason, changes to the lightshow can still be made using the RM’s trigger buttons while the computer issue is resolved. The new MyDMX-RM interface opens up ADJ’s popular and powerful myDMX software to even more potential applications. It’s flexible standalone function makes it ideal for installation in a wide variety of venues that need the ability to very simply switch between a variety of pre-programed lighting looks. Meanwhile, its convenient 19-inch rack-mount casing and the ability of its internal memory to serve as a backup against computer failure make it an ideal choice if you’re a professional mobile entertainer or lighting designer.